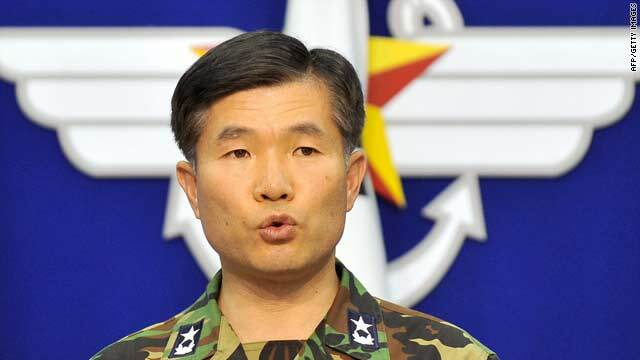 South Korean Rear Adm. Lee Ki Sik speaks in Seoul on Tuesday about the clash of North and South Korean navies. Seoul, South Korea (CNN) -- North and South Korea said their naval forces clashed Tuesday in disputed waters, and each blamed the other for what is the first such violent incident in seven years. South Korean Rear Adm. Lee Ki Sik said the nation's forces issued three verbal warnings to a ship from the Communist north once it had crossed a demarcation line late Tuesday morning. The South Koreans then fired a warning shot, but when the North Korean vessel continued southward, the South Koreans opened fire. Lee said the North Koreans returned fire before heading back, their ship damaged in the exchange. North Korea, however, defended its actions. The patrol boat was on "routine guard," according to a North Korean army report cited by the official Korean Central News Agency (KCNA), and the incident occurred because of "provocation perpetrated by the South Korean forces in the waters of the north side." "The South Korean military authorities should make an apology to the North side for the armed provocation and take a responsible measure against the recurrence of the similar provocation," said the report. Lee said there were no South Korean casualties, and the North Koreans report didn't mention any casualties in the clash, which occurred off the Korean peninsula's western coast. Another South Korean official told the nation's semi-official Yonhap News Agency that South Korea was not ruling out "the possibility that the clash may have been accidental." However, South Korean President Lee Myung-bak convened an emergency security meeting and urged the military to ensure that the naval clash did not escalate into something greater, Yonhap reported. U.S. reaction was muted. In a briefing aboard Air Force One, White House Press Secretary Robert Gibbs said, "I would say to the North Koreans that we hope that there will be no further action in the Yellow Sea that could be seen as an escalation." The naval skirmish comes just days after North Korea pressed for direct talks with the United States, saying the two need to settle their differences before meaningful multilateral nuclear discussions can proceed, state media reported. The reclusive Communist state pulled out of nuclear talks in April to protest the United Nations' condemnation of its nuclear test and missile launches. It has accused Washington of violating its sovereignty by singling it out and reporting it to the United Nations Security Council. President Obama is scheduled to visit South Korea next week on a trip to Asia that he begins on Thursday. North Korea will be one of the main issues to be discussed during the tour -- which also will take the president to Japan, China, and Singapore. North and South Korea have been bitterly divided since the 1950-53 war between them ended without a peace treaty. There was, however, an armistice with the U.N. Command establishing the Northern Limit Line (NLL), a demarcation on the Yellow Sea designed to avert clashes at sea. But the two nations dispute the exact location of the sea border, and North Korea does not observe the line. Clashes have occurred before in the Yellow Sea, especially during crab fishing season, according to the defense news Web site Globalsecurity.org. Since 2001, North Korean vessels have crossed the NLL 65 times -- 22 were this year -- though most of these incidents do not turn violent. The first clash since the Korean War that turned deadly took place in June 1999 when a North Korean ship was sunk. And in 2002, a series of North Korean incursions sparked an exchange that killed six South Korean sailors and wounded nine others.